I used to worry about winter as a photographer. The light is fleeting and its presence in harsh but once embraced it becomes an incredibly good friend at a wedding. Especially a wedding full of glorious florals courtesy of Samantha Powell. Wendy and Louis’ wedding was just this. A cold but bright winter wedding day in the gorgeous Norfolk Broads. What a way to finish my year with this spectacular Norfolk Winter Wedding. The day started with the bridal party getting ready. I realised quickly that this was going to be a fun day. Everyone was in high spirits and the prosecco flowed nicely. The very talented Melissa of Melissa Able and Hair was the makeup artist. The wonderful Amanda Steed taking care of the hair. After lots of giggles and something about a pair of teeth* I made my way downstairs to meet Louis and his family. I got Louis and his brothers outside for some shots in that awesome winter light then some pre-wedding drinks were ordered. Upstairs, Wendy and the girls were almost ready and after checking on the bridesmaids I went to take a few shots of wendy all made up. Bright light, cast striking shadows and the reflected light from the broad danced on the ceiling. Perfect for beautiful bridals portraits. Louis and his brothers waited nervously as the bridesmaids arrived. Wendy, with her father, followed and everything was perfect! A gorgeous ceremony in vivid winter light. 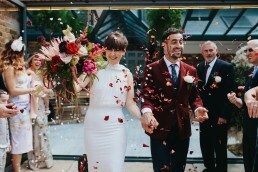 After the ceremony, Wendy and Louis left under a shower of petals as Husband and Wife (*It turns out a pair of teeth meant aperitif) to meet their guests for drinks before Dinner. 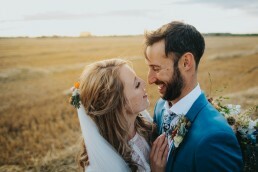 We managed to catch some of the light for some gorgeous portraits out on the broad and made the most of the beautiful blankets from Holly Honeywell Weddings. The cold got the better of us and it was time for dinner so we went inside. Once back in the warm I received a message from Emma at Buns of Fun. She’s a cake genius and she told me there was a ginger star behind the cakes for me. What a legend! Dinner came and dinner went. Speeches were made and people laughed, then it was time for the party. I don’t have many words for this party but I don’t think I need them. Just take a look for yourself. If you want to book, fill in the contact form here. Visit ‘About me‘ to find out more about Joshua Patrick.